Woden Town Square is mostly used as a thoroughfare between the bus interchange, office buildings, local services and Westfield. 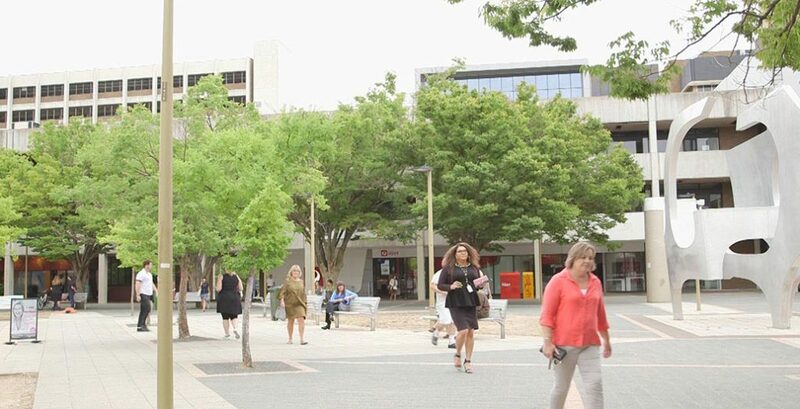 Street Furniture Australia, with support from the ACT Government, is working with the Woden community in Canberra to activate their town square through a six-month furniture installation. Members of the community, local businesses and politicians gathered to discuss the project and share their experiences of the square at a workshop held in March. 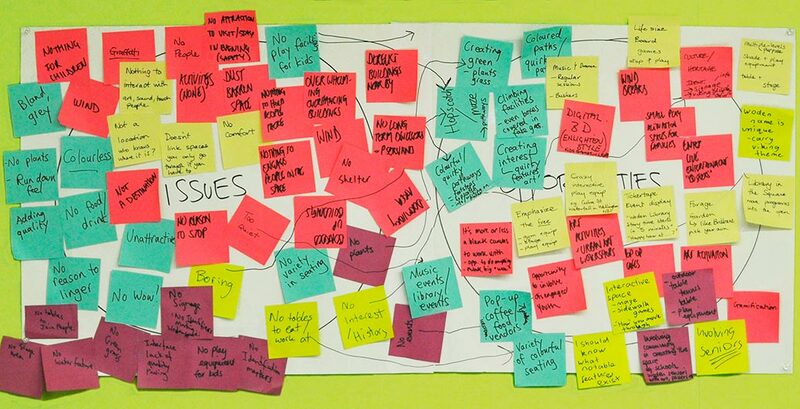 Around 40 participants brainstormed issues and opportunities for the square around ‘Retail Experience’, ‘Community Involvement’, ‘Comfort and Amenity’, and ‘Wow Factor’. “It was exciting to see so many people filling the room, with a great mix of people from community, business and local government creating an atmosphere of high energy and interest,” said Diana Hill, Manager Capital Works – Urban with Transport Canberra and City Services. “As a result many great ideas about issues and opportunities were discovered and collected by Street Furniture Australia. Desire lines are seen in patches of grass, matching the observed flows of foot traffic. Issues and opportunities captured during the #WodenExperiment Community Workshop. 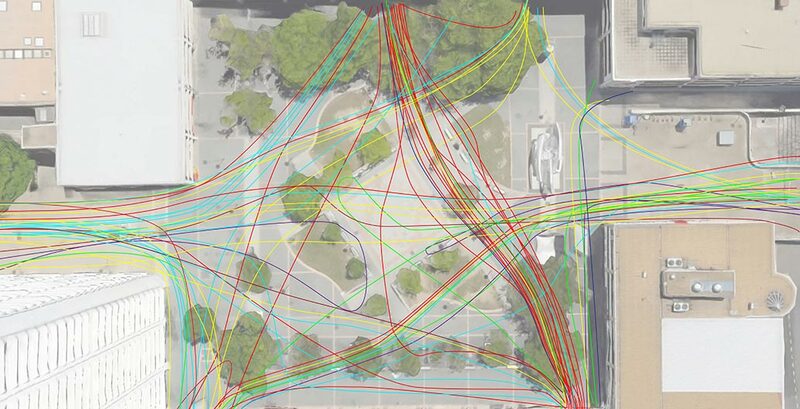 Mapping the pedestrian flow across Woden Town Square. The coloured lines represent different types of user. The workshop is part of a six-week user-centred Discovery phase, including empathy interviews, journey mapping and observation. A report will soon be delivered to the ACT Government and community, with recommendations for next steps. “The aim is to see how we can re-energise this place to become more vibrant and welcoming for the community,” says Street Furniture Australia Design Director Mark Armstrong. “It was wonderful to see people who work and live nearby, as well as representatives from local businesses and community groups, come along to help us understand their needs and wishlist for the square. The meeting was attended by two local Murrumbidgee MLAs, Chris Steel for Labor, and Caroline Le Couteur for the Greens. 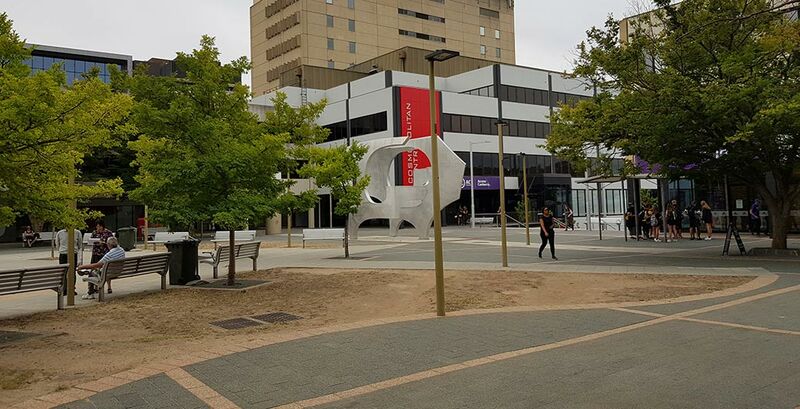 Woden Town Square is an open outdoor plaza in Phillip, Canberra, that links Woden Bus Station with a Westfield and the Library, Access Canberra, small businesses and offices for public service organisations such as the Department of Health. The six-month project is results-driven and builds on the success of #BackyardExperiment in Garema Place, which created a popular, colourful, family friendly space in a place similar to Woden Town Square. “In October 2016, #BackyardExperiment increased foot traffic by almost 200%, and attracted more families, couples, seniors and social groups to spend time in a thoroughfare,” says Street Furniture Australia Marketing Manager June Boxsell. “Adding some colour, lawn, moveable tables and seats, and colourful lights at night, created a welcoming atmosphere and transformed the area for the eight days of the activation. We want to see similar results for Woden, this time with a longer-term installation that tracks how the activation performs through seasonal change. To join the movement, follow #WodenExperiment on Facebook.